Windows Tools Theme Patchers. hello guys, today I want to share Windows Tools Theme Patchers for you all. All of this tools patcher can help you to easy patch windows system files and will be show effect themes. Remember, please disable your anti virus first before instaling patcher. Because some anti virus will be detect a tools patcher like a virus. Don't worry, this is not malware. Password rar/zip, please insert www.enjiriz-pc.com. 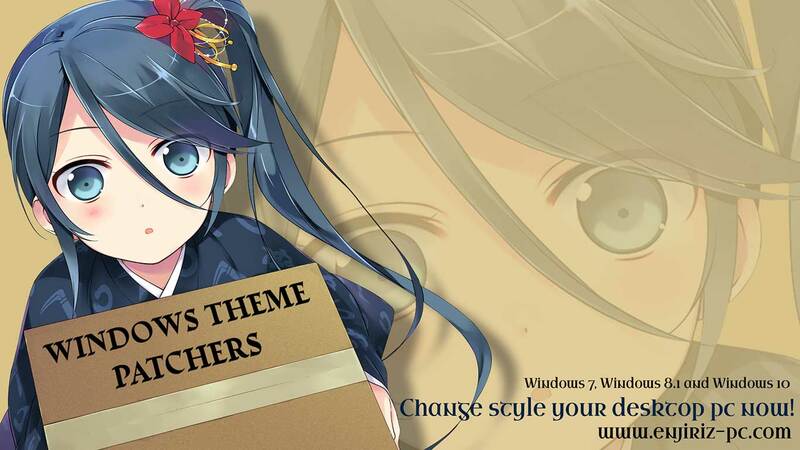 Download windows 7 theme patcher via Google Drive or Mediafire and read tutorial instaling patcher. Download windows 8 theme patcher via Google Drive or Mediafire or windows 8.1 theme patcher via Google Drive or Mediafire and read tutorial instaling patcher. Download windows 10 version 1607 theme patcher via Google Drive or Mediafire and read tutorial instaling patcher. Download windows 10 version 1703 theme patcher via Google Drive or Mediafire and read tutorial instaling patcher. Download windows 10 version 1709 theme patcher via Google Drive or Mediafire and read tutorial instaling patcher. Download windows 10 version 1803 theme patcher via Google Drive or Mediafire and read tutorial instaling patcher. Download windows 10 version 1809 theme patcher via Google Drive or Mediafire and read tutorial instaling patcher. 4. StartIsBack Plus 2.7.3 [Google Drive | Mediafire] Update File! Like I say it before, some anti virus will be detect a tools patcher like a virus. So, I proctect the patcher using password. Please insert www.enjiriz-pc.com to open files and don't forget to using latest version of winrar to extract the files. If you have any question, please visit our FAQ before asking. Maybe your question was answered.